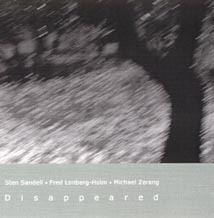 Sten Sandell, prepared and unprepared piano, voice; Fred Lonberg-Holm, prepared and unprepared cello; Michael Zerang, multiple percussion, zither. Recorded on 21 April 1998 at Airwave Recording Studios, Chicago, Illinois. Cover photograph (reproduced above) Dancer; Province by Gregory J. Lawler; graphics by Russell Summers.